JQSerialPagerContrib is not installed on Foswiki.org. This is a jQuery plugin for Foswiki that implements a widget to handle long lists. It therefore splits the list and adds a pager so that it takes less screen estate overall to display all list elements. 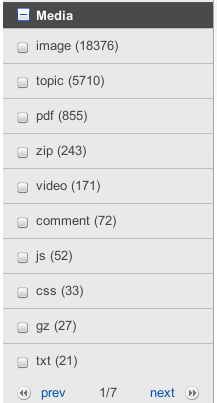 This kind of list pager comes in handy when displaying lots of navigation elements in a sidebar navigation. This is a screenshot displaying a facet navigation in SolrPlugin listing all media types available in the current hit set of a search. the serial pager widget is available for use on the current page. This will process lists wrapped into a DIV element using the jqSerialPager class. This will process all list items inside according to the given parameters. Note you need to run configure & save at least once. This will automatically register the serial pager widget to Foswiki. Topic revision: r7 - 30 Aug 2017, MichaelDaum - This page was cached on 25 Apr 2019 - 07:17.